Black pudding is a type of blood sausage commonly eaten in Britain and Ireland. It is generally made from pork blood and a relatively high proportion of oatmeal. In the past it was occasionally flavoured with pennyroyal, differing from continental European versions in its relatively limited range of ingredients and reliance on oatmeal and barley instead of onions to absorb the blood. It can be eaten cold, as it is cooked in production, but is often grilled, fried or boiled in its skin. In the United Kingdom, black pudding is considered a delicacy in the Black Country, Stornoway and the North West, especially in Lancashire, in particular the towns of Bury and Ramsbottom, home of The World Black Pudding Throwing Championships, where it is sometimes boiled and served with malt vinegar out of paper wrapping. The Stornoway black pudding, made on the Western Isles of Scotland, has been granted Protected Geographical Indicator of Origin status. 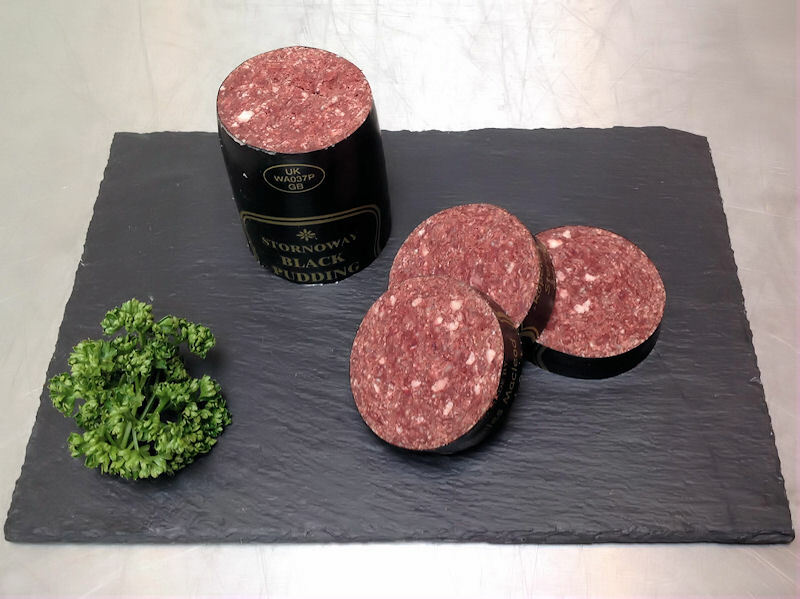 Black puddings are also served sliced and fried or grilled as part of a traditional full breakfast in much of the UK and Ireland, a tradition that followed British and Irish emigrants around the world. Black pudding is now part of the local cuisine of New Zealand and the Canadian provinces of Nova Scotia and Newfoundland and Labrador. While "blood sausage" in English is understood in Britain, the term is applied only to foreign usage (e.g. in the story The Name-Day by Saki), or to similar blood-based sausages elsewhere in the world. White pudding or oatmeal pudding is a meat dish popular in Ireland, Scotland, Northumberland, Nova Scotia, and Newfoundland. White pudding is very similar to black pudding, but does not include blood. 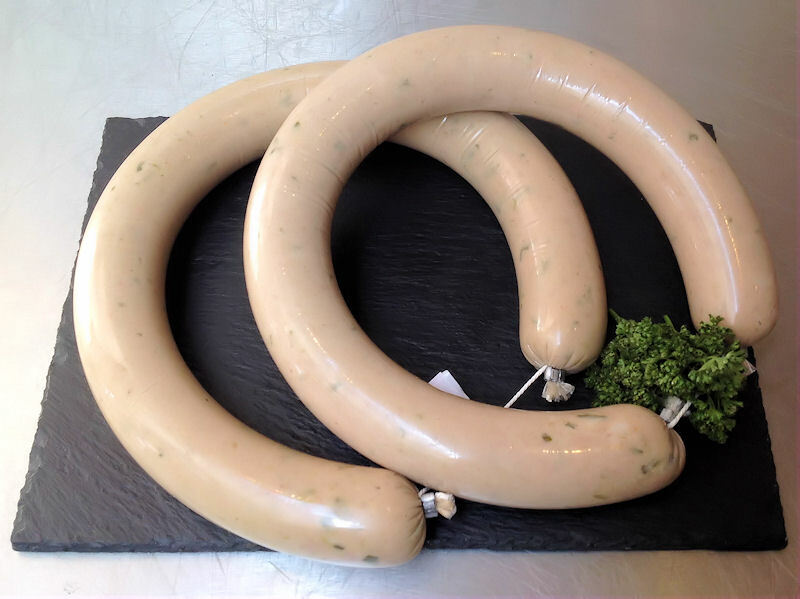 Consequently, it consists of pork meat and fat, suet, bread, and oatmeal formed into the shape of a large sausage. Earlier versions (pre-1990) often had sheep's brain added as a binding agent. A similar pudding, known as Hog's pudding, is made in Somerset, Cornwall and Devon though it is much spicier than white pudding, as it contains black pepper, cumin, basil, and garlic. In Scotland, white pudding can also be known as mealy pudding and does not always take the form of a sausage. It consists of suet, oatmeal, onions, and spices. Some versions of Scottish white pudding are suitable for vegans, in that they contain no animal fat, vegetable fat being used instead. The pudding may be cooked whole, or cut into slices and fried or grilled. It is an important feature of the traditional Irish breakfast. White pudding (as well as its black and red relatives) is also served battered at chip shops in Scotland as an alternative to fish (see fish and chips). When served accompanied by chips, it is known as a white pudding supper.